When it comes to celebrity Rolex watches, nothing tops the Daytona chronograph watch worn by the late actor, racecar driver, and philanthropist Paul Newman. In fact, Paul Newman’s Daytona sold for a record-breaking $17.8 million in 2017. However, among the celebrities who wear Rolex Daytona watches, Paul Newman was far from the only famous person who appreciated Rolex’s signature chronograph watch. The Daytona is most certainly one of the most popular Rolex watches worn by celebrities. Let’s have a look at a few of our favorite ones here. In 2016, Rolex made headlines at Baselworld by unveiling the new stainless steel Daytona ref. 116500LN. This was the first time Rolex offered a steel version of the Daytona. It was with an ultra-modern Cerachrom ceramic bezel, and was a huge hit. Due to its popularity, the Daytona ref. 116500LN is one of the toughest Rolex watches to find right now. So it comes as no surprise that celebrities like to wear them. Take for instance, rapper and business mogul, Jay-Z, who is a well-known celebrity watch collector. He is typically a fan of platinum, gold, and gem-set luxury timepieces from the likes of Patek Philippe, Audemars Piguet, Richard Mille, Hublot, and of course, Rolex. However, we don’t often see Jay-Z wearing a steel watch. But then again, the steel Daytona ref. 116500LN is in a league of its own and it looks great on his wrist. For some men, a gem-set watch may be a hard pull off. But for celebrities who live in a world of extremes, a diamond timepiece fits just right. Guitarist extraordinaire John Mayer is a familiar face in the watch enthusiast community with a fantastic collection of his own. And among the many watches he owns, he’s been spotted several times rocking a white gold Daytona ref. 116599 RBOW with a colorful sapphire bezel. Aptly nicknamed the Daytona Rainbow, Rolex currently has three versions of this ultra lavish sapphire Daytona. The first one is in yellow gold. The second one is in white gold, and most recently, the third in Everose gold. The last time we saw John Mayer wearing his Daytona Rainbow was while sampling some wings on the popular web series, Hot Ones. While the Daytona is officially classified as a men’s watch, that doesn’t deter ladies from wearing the famed luxury chronograph watch. Particularly popular versions of the Rolex Daytona among the female celebrity crowd are the Everose gold models. We spotted this one on the wrist of fashion designer and ex-pop star, Victoria Beckham. As a fashion designer, Victoria Beckham knows a thing or two about great taste and she wears her rose gold Daytona chronograph beautifully. With a larger sporty style and a warm rose color, the Everose gold Daytona strikes a great balance between an oversized woman’s watch and precious gold timepiece. Comedian and actor Kevin Hart is another celebrity that isn’t shy about showing off his obsession with luxury watches. 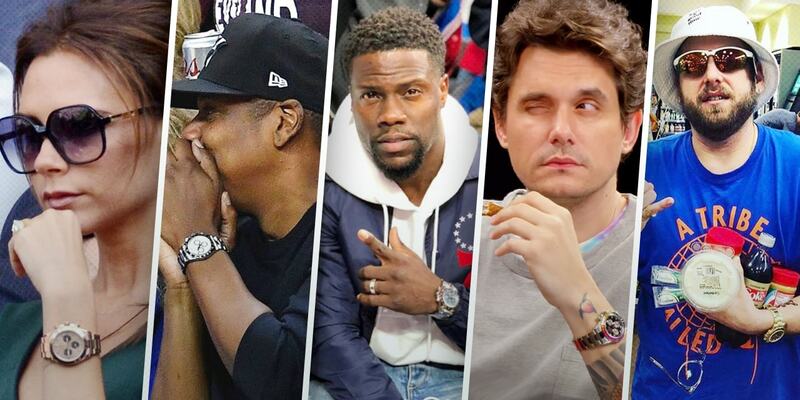 It’s hard to keep up with what Kevin Hart has in his collection, as it seems he wears a different watch each time he steps out in public (or snaps an Instagram pic). One of the brands he wears the most is Rolex with a slew of different Daytona chronographs in rotation. A standout model he wears is the platinum Daytona ref. 116506, which Rolex released in 2013 to mark the 50th anniversary of the Daytona. With its brown ceramic bezel and ice blue dial, this is an instantly recognizable Daytona watch. Actor Jonah Hill took the next step in his career by writing and directing the new movie, Mid90s, in theaters right now. Film critics and fans alike have praised Jonah Hill’s directorial debut. So, it wouldn’t surprise us to see more writing and directing projects from this charming celebrity. In terms of watches, Jonah Hill has a penchant for yellow gold ones like a gold Nautilus, a gold Day-Date, and a gold Daytona. We particularly like Jonah Hill’s yellow gold Daytona ref. 116508 fitted with a bright green metallic dial, which came out in 2016. Just like Paul Newman, frontman for Maroon 5 Adam Levine is a fan of vintage Rolex Daytona watches equipped with the “exotic” dial—now known as the “Paul Newman” dial. Although he has a host of enviable vintage Rolex watches in his collection, there’s one that he favors above all. Adam Levine recently told The New York Times that, “My most prized possession is my watch. I bought it about eight years ago, and it’s a Rolex Paul Newman Daytona. It was a major luxury purchase, and I will never, ever get rid of it. You can go plenty of directions with a Rolex — there are so many bad ones — but the right one from the right era is something special.” We couldn’t agree more. Regardless of the material or production era, it’s clear that the Rolex Daytona watch is a celebrity favorite. Stay tuned for our next article where we’ll highlight celebrities who wear Rolex Sea-Dweller watches.